Fan of Metro UI? Then MetroMan is for you. 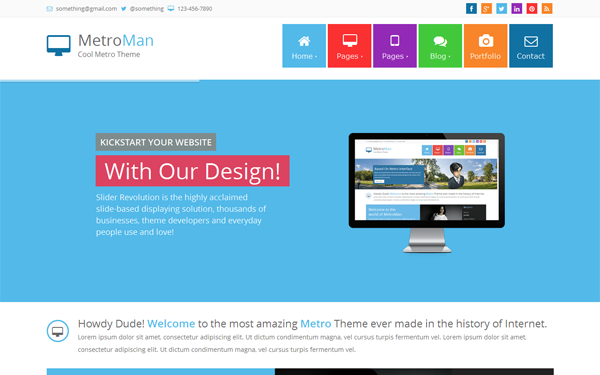 MetroMan is a professionally designed Bootstrap theme which is fully based on popular Metro UI. It supports all features of Twitter Bootstrap. So play with MetroMan. Full Copyright License on sale for $30. Find more themes at wrapbootstrap.com. MetroMan - Responsive Metro Theme can be used on ANY Windows Server (2000, 2003, 2008, IIS) or Windows Hosting Plan that supports ASP (3.0 or greater) which is standard on ALL windows servers or web hosting plans. Full lifetime access to the MetroMan - Responsive Metro Theme support portal. One big advantage to using MetroMan - Responsive Metro Theme is that although it's "ready to go, right out of the box," it is also fully customizable. You can use ANY HTML editor to edit the application pages, including: Dreamweaver (all versions), Expression Web, Front Page, Go Live, Notepad etc. or any other HTML editor. You can learn more about customizing DMXReady apps in our customization guidelines.